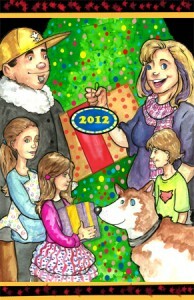 I finally finished my Christmas card for 2012! First in a couple years. I always enjoyed doing them but with kids, work and all that happy stuff time for doing a card has been in short supply. Anyhoo, here’s wishing you and yours a terrific Holiday season and Happiest of New Years!